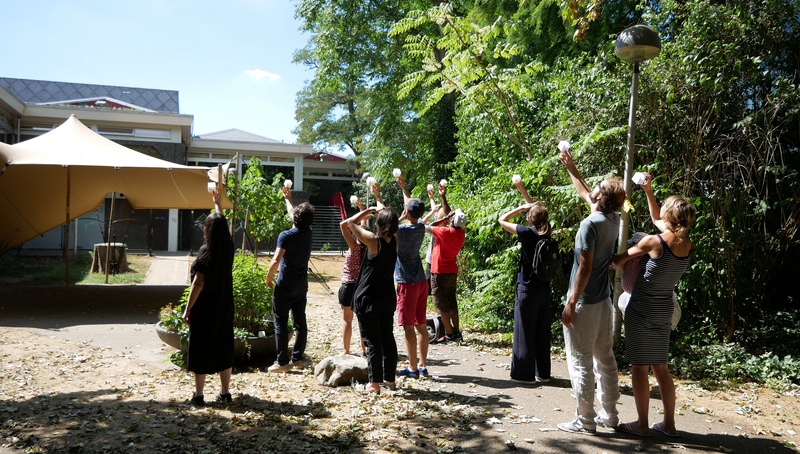 Omnigaze is the annual activity during which people around the world share the action of looking at the same point in the sky at the same time. To find this shared point, attendees use the omnigaze device which is made out of printed and cut-out paper and works based on the position of the sun and the attendee’s location. This year the 8th omnigaze coinsided with and was the opening event of the ‘Near enough?’. Using the omnigaze devices, some of which were provided and some build and brought by the visitors, we joined with others around the world in omnigaze from the tolhuistuin garden. Omnigaze is an on-going project initiated and run by Joubin Zargarbashi.